This was published in the Arts & Letters supplement of the Dhaka Tribune, a new English daily in Bangladesh, on October 12, 2013. You can read the Arts & Letters Supplements here. Monday evening, 28 October, 1963. Hundreds take their seats at the Race Course in Dhaka, excitement buzzing through the crowd. On the stage stands an upright bass and a drum set, along with a piano brought over from the Goethe Institute. There is a slight dampness in the air, and a piano tuner has been asked to stand by. After an introduction, more than a dozen musicians from the U.S., mostly black men, take to the stage. The horn section brings along their well-loved trumpets, saxophones, and trombones. The silence of the night is broken by the melody of Billy Strayhorn’s composition, “Take the A Train”, familiar to some because it is the theme of the Voice of America’s Jazz Hour. It will be followed by other tunes like the wistful “Mood Indigo” and the swinging “Things Ain’t What They Used to Be.” For an hour and a half, the Duke Ellington Orchestra, with some of the world’s finest jazz musicians – including Paul Gonsalves and Sam Woodyard – will make the Dhaka air reverberate with the soulful and sizzling sounds of jazz. In the wings sits a young Assistant Cultural Affairs Officer at the USIS who has made many of the arrangements. Dhaka is Gail Minault’s second posting after Beirut. She hired the venue, and in the months before, she organized presentations on jazz to local musicians, students, and faculty from Dhaka University. She used tapes she had prepared in Beirut for lectures at the American University, including music from the Smithsonian Jazz Collection. Blues, Ragtime, Big Band, and Modern Jazz. 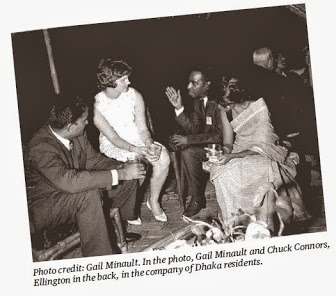 Later that evening at a party in Dhanmondi, Gail chats with trombonist Chuck Connors and alto sax player Johnny Hodges. She agrees to drive them to old Dhaka to buy souvenirs. She was proud of her first car, a powder blue 1956 Volkswagen Beetle. In that car, she picks up three band members from Hotel Shahbagh and heads for Dhakeswari Bastralaya. While she maneuvers her way through rickshaws, bullock carts, and pedestrians on Nawabpur Road, Johnny Hodges jokes that Gail drives like a Damascus cab driver. She takes the remark as a compliment. There is reason for the rush: in the afternoon, the musicians will fly to Lahore for their next engagement. After that, Karachi. The band had already visited India and Ceylon. This was not the first visit of a jazz ensemble to Dhaka. Dizzy Gillespie had come in 1955 with a band that included a young Quincy Jones. Dave Brubeck followed in 1958. But those concerts had been more elite affairs held at the Shahbagh. When Ellington arrived, there was a bit more interest in jazz and the USIS invited a larger section of people. I was still a child and do not remember hearing anything about this concert, then or later. But in the late 60s, I attended two shows: the Charlie Byrd Quartet and the Indiana University Jazz Band, both held at the Engineers Institute. These concerts, along with jazz on shortwave, were for me an early introduction. The seeds they planted lay dormant for a long time. It would be in the 90s, in Detroit and New England, where my love for jazz grew. It would be music played live, in clubs, halls, and festivals, that consummated my love affair. More than anything else I marveled at the way the bands combined collaboration and solos to create a sound of complexity and emotional variety. There is a story worth sharing about how I learned of Ellington’s visit. Some months back I was searching for information on the Bangali playwright Sayeed Ahmad who wrote several plays in English in the 60s. He had been published in Vision magazine out of Karachi, and in one of their issues I learned that Ellington visited Pakistan in 1963. That clue led to a book which carried an article by Gail Minault that included anecdotes from her time in Dhaka. After her stint there, she left the foreign service and went on to graduate school where she focused on South Asian history. The name sounded familiar. Then I remembered. I had met her in 2011 when I gave a talk at the University of Texas. A professor of history there, she told me that she had worked at USIS Dhaka in the early sixties. I contacted her again and she graciously shared more details. She also sent the photo printed on this page. The Ellington visit was part of the U.S. State Department’s cultural tours which took place from the 50s through the mid-70s. You cannot imagine such major stars being sent around today to create goodwill for the U.S. But those times were different. The Cold War meant that both superpowers were eager to show off their culture, and the U.S. was on the defensive in Asia and Africa. The news was full of stories of black people being beaten, jailed and killed. Washington decided to send a large number of black artists as cultural ambassadors. Racists in Congress were not happy. And jazz was not well regarded in elite circles: to them, it was music tainted by sensuality, ostensibly originating in brothels. Yet an alliance of liberal bureaucrats and black artists managed to come together to promote jazz and send out majority black bands as the artistic face of the United States. But no matter what the policy makers wanted, the musicians followed their own script. Despite grueling schedules, they were happy for the chance to play, make some money, have fun, and travel the world. Gail Minault pointed me towards a book that provides a good picture of the context: Penny M. Von Eschen’s Satchmo Blows Up the World: Jazz Ambassadors Play the Cold War. What I liked about the book is that it shows that despite the Cold War political motives, the jazz tours did not reduce to propaganda. Despite the irony of black artists being promoted in a way discordant from black people’s realities at home, these tours had a positive impact. It brought jazz to places like Colombo and Dhaka. To local musicians. To music loving people like me. And it brought black artists before global audiences and new influences. Artistic creation thrives with exposure. From Mozart borrowing Ottoman influences to Rabindranath mining both hymns and folk melodies, music has always flourished with contact. Ellington himself composed his Far East Suite incorporating elements he had absorbed on his Middle East/South Asian tour. No doubt there were musicians in Asia who absorbed new ideas that flowed into their own creations. I wonder who in Dhaka still has memories of the visit. Photo credit: Gail Minault. In the photo, Gail Minault and Chuck Connors, Ellington in the back, in the company of Dhaka residents. I was there at that concert…i was 16 years old …this was a fun post to run across.. Thank you for this outstanding and historic post. The relationship between Harlem in New York City and Bengal predates partition, when Bengali Lascars or merchant marines early on had commingled with the Harlem community. Please do read Bengali Harlem by Vivek Bald. The cultural centers for Jazz such as Harlem, New York and New Orleans, Louisiana had its share of Bengali influence that is virtually unknown. Thank you again for this most precious post!